Acquiring wisdom is both a human task and a divine gift. Wisdom aims at the formation of character, and there is no better guide than the Book of Proverbs. The Proverbs teach us how to be wise and self-controlled, and how to do what is honest, right and fair. In these pages, Fr. 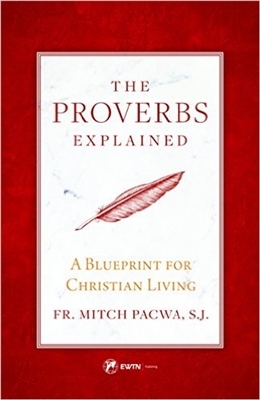 Mitch Pacwa, host of EWTN Live, will help you make the most of the treasure-trove of practical advice found in the Book of Proverbs. He explains in a succinct and readable way how God's blessing is related to our behavior, how you can be like God, and how to live in accord with His law. Because each Proverb is true in a certain sense and applicable in a certain way, Fr. Pacwa helps you relate each Proverb to your particular state in life as well as to your own spiritual journey. The message of Proverbs is simple, yet difficult to live out. Read these pages, and you'll come to understand the practical side of righteousness, and you'll begin to grow in wisdom through patience, prayer, and God's grace. Size: 5.4" x 0.5" x 8.4"